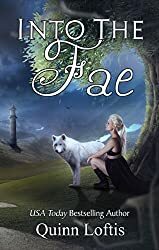 Into the Fae by Quinn Loftis is the start of the Gypsy Healers series, a new spin off series set after book seven of her Gray Wolves series. Peri and Lucian are back, and fighting the bond of course. At least, Peri is. Lucian’s just glad she’s his. Bringing into the front some lesser characters from the Gray Wolves books, Elle, Sorin, Crina, and Adam also star. Of course, Sally and Costin are right in the middle of the mix. This brings us to the Gypsy Healers. There are five new ones in the world, and Peri’s evil sister is trying to get to them before Peri and gang can rescue them. It’s a fight for five teenage lives, and the power of the wolves who might just someday be their mates. Of course, Peri keeps the humor intact and even Sally steps up with an inner strength she hasn’t needed before. And these five girls though they were human, and they’re not. All in all, this book lives up to Gray Wolves standards and I’m so excited to continue in the world we love. The humor and charming wit, the fighting spirit, and the possessive, bossy nature of wolves all come back to play! If you like this one, the rest of the series is coming! You can watch the progress on the author’s website. While you’re waiting, go ahead and read the Gray Wolves series. You won’t regret it and you’ll understand the group dynamics a little better!